2. Now, Ministry of Finance, Department of Expenditure vide their O.M. No. 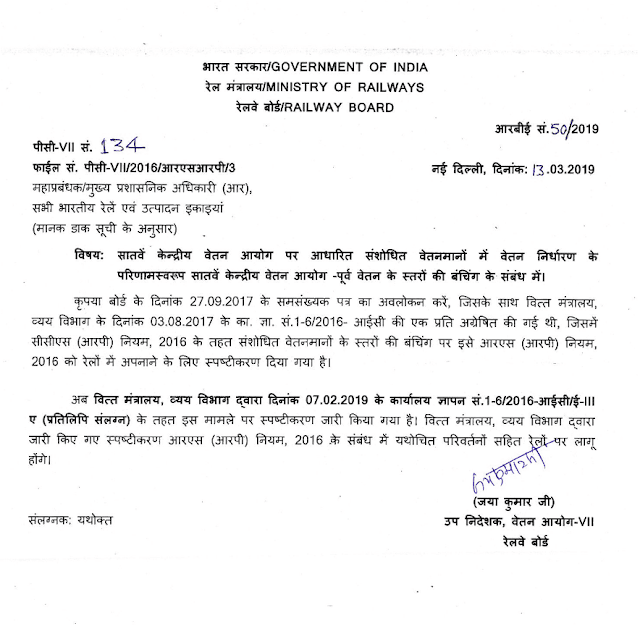 1-6/2016-IC/E-IIIA dated 07.02.2019 (copy enclosed) have issued further clarifications on the subject matter. The clarifications issued by Ministry of Finance, Department of Expenditure shall be applicable mutatis mutandis in Railways with respect to RS(RP) Rules, 2016. RBE No. 50/2019, Bunching of stages of pay in the pre-7th CPC pay scales consequent upon fixation of pay in the revised pay scales based on 7th CPC — regarding.